Following the sharp sell off that followed the FOMC meeting on Wednesday and with all the commodity markets falling on Thursday, Friday was a relatively quiet day for spot silver prices, which initially rallied, only to close on the silver spot chart marginally lower with a narrow spread down bar, but with a deep wick to the upside. This is in sharp contrast to gold prices which ended on Friday with a deep shadow to the bottom of the candle, suggesting an attempt to rise early in the week, and therefore somewhat at odds with the spot silver chart. 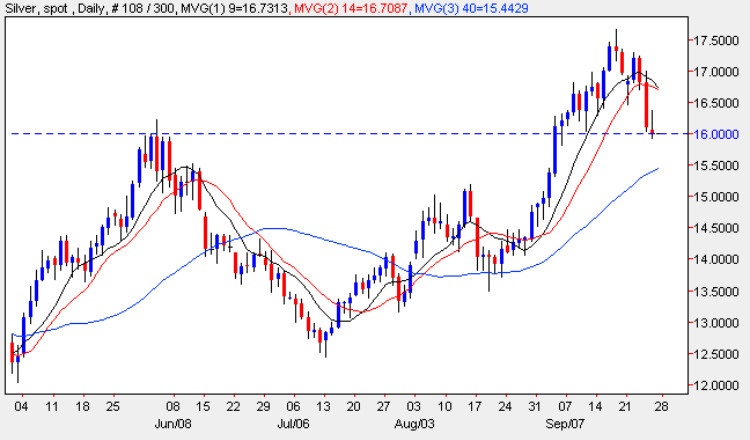 From a technical perspective the spot silver chart remains mildly bearish, as we can see from the weekly chart with last week’s wide spread down bar confirming the doji signal of two weeks ago which first signalled weakness in the market. The weekly chart is, of course, less clear, simply signalling last weeks fall, and giving few clues as to the market direction this week. All that can be said is that the spot silver chart is now approaching the minor support level just below the $16 per ounce level, which may provide a platform for any recovery and reversal higher. However, with the 9 and 14 day moving averages now starting to turn sharply lower, this again is a bearish signal, and we now need to wait to see if the 40 day moving average can provide any degree of support to a further fall. If so, then we could see a recovery and bounce from the $15.50 price handle in due course, and with gold looking set to recover in the short term, this seems a likely analysis at present.